Most children like to eat but for some an insatiable appetite means they always want more, causing real problems for parents. It was one incident in particular that drove home to Emily just how voracious her four-year-old daughter's appetite is. "It was really early in the morning and I heard the freezer door alarm go off. I went down to the kitchen and found my daughter eating frozen potato cakes straight from the packet. We don't have them in the house anymore, we can't." Emily, not her real name, describes it as a "low point", but she has come to accept that whatever food is in the house her daughter has a big appetite for it. "I remember the world's most enormous carrot poking out of her skirt pocket on the way to her first day at drama class. She told me it was in case she got hungry. It's curious and complicated being the parent of a child with a compulsion to eat." Children's eating habit are constantly in the news and for good reason. Just recently it was reported there has been a four-fold increase in the number of children and teenagers admitted to hospital for obesity-related conditions in the last decade. Appetite differs from person to person, say scientists. "We are all designed to be variable," says Prof Stephen Bloom, an obesity expert from Imperial College London who studies the body's appetite control systems. "You can tell from the outside each person is different, it's the same inside our bodies." At each end of the scale you get extremes, from children who pick at their food to those who want to eat almost constantly. Despite what people often suggest it's not always down to bad eating habits, says Michelle, not her real name. Her 11-year-old son is always hungry and she says managing his diet is complicated and exhausting. "You often get frustrated and angry with your child for being so hungry and they get frustrated and angry with you, but in our case I don't think anyone or anything is to blame. "There is nothing wrong with my son, no medical condition or issues with food. He is genuinely hungry, not greedy. I don't blame myself as I do all I can to feed him healthy food. "It can be exhausting, you always have to be on top of things. You try not to make a big deal as you don't want your child to develop problems with food. "He isn't overweight at the moment because I am controlling what he eats. I'm also trying teach him about food and to understand the consequences of making bad choices. But he won't always live at home with me and I do worry what will happen in the future." Weight often becomes an issue for parents in the same situation. It is a concern for Emily, but she says her daughter has always been bigger than her siblings, as well as hungrier. "She fed well as a baby and was often off the upper end of the baby weight whereas her older brother is tiny," she says. "It's not what she is eating, she will snack on sugar-snap peas as happily as another child would eat a biscuit. I am strict and at times she has screamed and wailed, but I have been firm and she has learned what she is allowed. She simply loves food." As children get older, their life extends beyond the home and the struggle gets even harder. "On her first week at school she was going up for seconds at school dinners and being given them," says Emily. "I've had to change to packed lunches as it is the only way I can control how much she eats and what she eats." Research is being done into how to control appetite. "We actually know very little, appetite is such a complex thing," says Sadaf Farooqi, a professor of metabolism and medicine at the University of Cambridge. She also heads the Genetics of Obesity Study, a cohort of doctors, nurses, scientists and research staff working together to understand why some people put on weight more easily than others. "What we do know is there is an inherited, genetic component to appetite but it is also regulated by environment and behaviour, among other things." Taste also comes into it, she says. Scientists know not all people experience taste in the same way and some foods can taste nice to one person and unpalatable to another. 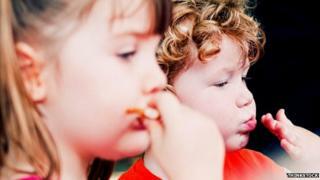 Some advocate leaving children to eat what they want as long as it is healthy, as clinical evidence suggests that children naturally eat to their appetite. "Children don't typically eat more than they need," say Tam Fry, spokesperson for the National Obesity Forum. "If you leave them to make their own decisions they learn how to regulate food. If they are putting on weight you up the amount of exercise they do. It's about balancing energy in and energy out." But some parents dispute they are contributing to the problem and say such opinion leaves them feeling isolated. "I've been told this by people before," says Michelle. "When it comes to my son I just don't think it is the case, it's the way he was made." In the end parents come up with their own coping mechanisms. "I talked to my husband, we came up with ground rules and explained them to our daughter," says Emily. "We are managing at the moment but we know that as she gets older we will face different challenges."